Clubhouse fitness is made up of a range of in-house and external expert instructors, covering many different activities. Our aim is to help people work on their fitness and well-being, in a wonderful location.  Clubhouse Creche is available during most morning and early afternoon fitness classes. See below for details. Wonderful Yoga sessions, whatever your age and ability. 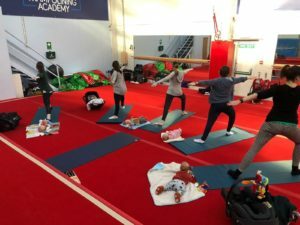 Parent and Baby Yoga is a great way back into exercise after the birth of your baby, and also have special time to bond with your little one. No need to bring a Yoga mat, just bring you and your baby! Lay them down on the comfy sprung floor, whilst you go through your exercises with Emma. TIME: 9:30am – 10:30am Term time. During School holidays, classes will still run; but at 9:00am – 10:00am. Mixed ability Pilates class tailored especially for the over 50s. Using the Australian Physiotherapy Pilates Institute (APPI) matwork repertoire to build on core strength, mobility and balance, to keep you fit and healthy. 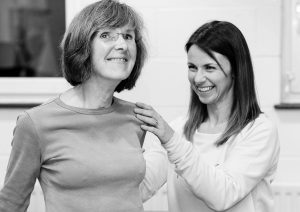 Taught by experienced Physiotherapists that know your needs. We use a variety of small equipment to continually challenge your body. Come along for a free taster session and then book onto a block of 6 sessions for £48. 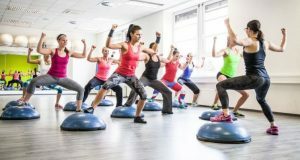 BOSU fitness can be used by all abilities, male and female, sport specific or for general fitness. BOSU can be used both sides and can challenge your total body! Training the core strength/ stability, legs, arms, and cardio fitness. Nicola is offering a special deal: Buy a block of 4 sessions for £24. These can be used for either the Wednesday and Friday sessions. We’ve listened to you, and we hear you want evening gym and trampolining classes…so here they are! We have combined all the learning, exercise and fun of the two separate classes into one Gymnastics and Trampolining session. Holding yourself upside down for long periods of time, flipping through the air, using rings and bars and all the other amazing stuff involved in gymnastics will get you seriously strong. Gymnasts have a level of strength that most normal people would consider near superhuman strength—but even training in gymnastics as an amateur will get you upper body strength, core strength and power like no other workout can do. It doesn’t matter how inflexible you currently are—training in gymnastics will make you a more flexible person. The trampolining really works on your core and is a fantastic work out! No matter your age, gymnastics will bring you back to the days when childlike wonder filled every moment. PRICE: £8 per session pay as you go. 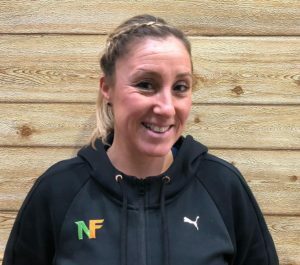 PLEASE NOTE: there will be no sessions on Thursday 2nd & 9th May due to Claire having an operation…good luck Claire! Insanity is a maximum interval training programme, a total body workout that requires no equipment. You exercise, using your own body weight for resistance, and it is intense; but gives great results! Great to do it in a group environment, to push you to achieve your best. Please find below our term timetable, running up to Easter break.